We had a full van load for the bird tour this morning that started out with dense fog. Viewing birds is difficult when you can only see ten feet in front of you. We had a good group on the tour with folks from Wisconsin, the Upper Peninsula of Michigan, and Dallas, TX. The fog lifted for the second half of the tour and we hit the back roads of the refuge. 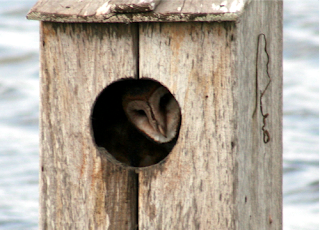 I tried to show the visitors the barn owls in the duck box that I posted pictures of a few days ago, but they didn't cooperate and apparently were not in the box this morning. We did see a nice variety of birds, though and everyone appeared satisfied with the experience. After lunch, I drove Diana into Harlingen so I could pick up my new car and she could drive the old one back to the refuge. I ended up buying a new 2009 Ford Focus. This time, I got a four door sedan that gives me a little more room to transport my DISH network equipment in with room to spare for the new vacuum I've purchased here. My son and his significant other want my old Focus and Crystal will fly down from Denver to pick it up later this month. Between now and then, I will have time to get a new base plate for towing the car and have the braking system changed over. The ride back to the refuge was considerably more comfortable on the miserable roads than was the ride in. There have been a lot of pleasant changes in six years to the Focus. In order for me to tow it behind the motorhome, I again purchased a manual transmission. This new car has more upgrades than my basic '03 model and I think I'll enjoy the electric windows, remote lock/unlock, cruise control, and Sirius radio that came with it. I can even load six CDs at a time. That should come in handy this summer when I'll make a few trips from Missouri to Chicago and Rochester, MN, on my days off from Swan Lake National Wildlife Refuge. One of the dilemmas upon returning to the refuge was what to do about lighting both engines for the next couple of weeks. It's really a no brainer, in that the light I have will go under the hood of the new car to keep the rats at bay. I have parked the old car close and raised the hood. At nine this morning, we began to gather to go on an adventure to check off one of the items on my Bucket List. The seven of us piled into two cars and headed for South Padre Island. 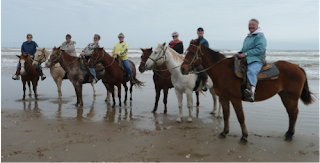 We had reservations for a horseback riding excursion on the beach of the Gulf of Mexico. The wind was blowing, but the temps were in the sixties and we slowly headed out. I'm sure glad I wore my windbreaker! The building in the far back is called the Leaning Tower of the Island. It seems after quite a few floors were erected, the building began to lean since the footers weren't put down to bedrock. Construction had to be halted, and so it stands unfinished. All of us had a fun time on our ride. What a great bunch of wild women we have volunteering ...Yee haw! We were all pretty hungry after our ride, so we went to Marcello's in Port Isabel and most of us had a great shrimp and fish all-you-can-eat lunch. It was much better than the shrimp lunch that we had a while back in Brownsville. How do you like that? No bird pictures for today. Hey, so I started out this evening seeing if I could upload pictures tonight. I was surprised to get the first one up in about five minutes. Then it took me another two hours for the others. It is frustrating to average about one picture an hour. It's a good thing I'm retired and can do other things like washing dishes while I wait. It seems to have a lot to do with my air card Internet connection, and even though my connection monitor shows that I'm connected, apparently it is not always good enough for the picture uploads. Sunday, is my laundry day and I was able to get that accomplished this morning. With seven different RVs here, it's not always easy to get to the washers and dryers. Today was also the beginning of the last fire arms hunt for this year. The weather was overcast and chilly with a brisk wind out of the north, but I saw at least one deer being put into the cooler. One of the blogs that I follow has an author that is attempting to take a picture each day for a year straight. She has been at it for almost two months now and I think it is an intriguing goal. I've thought of trying the same thing myself, but find getting pictures up on the blog to be quite challenging. I do enjoy seeing what she takes pictures of, though. Some very ordinary things that we take for granted can be interesting when you stop to look at them. Since many of my pictures have been of birds, it would give me the opportunity to broaden my photographic subjects. Maybe I'll try starting tomorrow, but for today my pictures will be of birds. 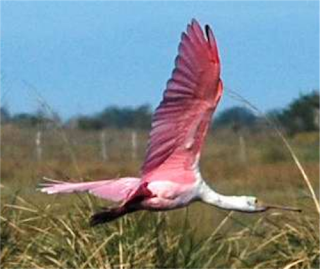 I just really enjoy seeing these Roseate Spoonbills.....isn't nature wonderful how species evolve to have adaptations that meet their specific needs. I have the next two days off, so will pursue things outside of the refuge. Tomorrow, I hope to check off one of the things on my Bucket List...horseback riding on a beach. Then on Tuesday, I may look into buying a new car. Time will tell what happens. 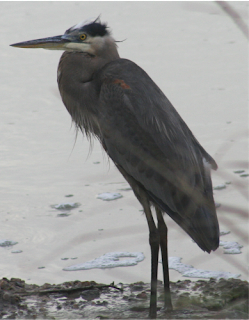 Great Blue Herons (GBH) are quite numerous on the refuge. This one has its neck all tucked in. P.S. Sometimes I can't seem to get any spaces between paragraphs...don't know what's up with that. After 24 hours of trying to download or upload the pictures, I was only successful with one. I will try again tomorrow. This is a picture of the guys working on setting up my new TV. It's great to have friends! There are a few more moderations that need to be done, but overall I am very happy with the results. The picture I am getting on the new TV is very good and soon I won't have any worries about moving on down the road. Anyway, I have been watching a nest box along one of the back roads of the refuge. For those of you up North, it is the same as a Wood Duck box that is commonly erected in ponds to help the ducks find nesting sites when holes in old trees and snags are not available. Well, down here the same type of boxes are used for Black-bellied Whistling Ducks. Nesting season is over and sometimes other birds and animals use these boxes. The box I have been interested in held quite a surprise the other day. Inside, I spotted a Barn Owl roosting there during the day. Since they only hunt at night, this was a good place to spend the daylight hours. 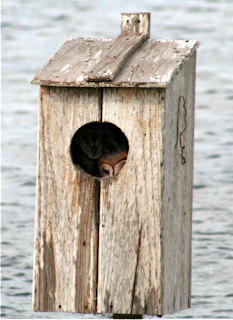 If you look closely, you can see that there are two Barn Owls roosting in this box. What a "hoot" it was to discover this! Regardless of what the post says, it is now almost midnight so I had better get to bed. Emma is up at six no matter what time we go to bed. Today was the first presentation of our "dog and pony show"...a powerpoint program about Laguna Atascosa National Wildlife Refuge and what visitors can do on the refuge. Janie and I set out for the Eastgate RV and Mobile Home Park in Harlingen first thing in the morning. About forty folks showed up for the program and despite a few technical issues, it all went well. Several people said they would travel to the refuge this afternoon for the tram tour, and I noticed that the two o'clock tour had more than the usual amount of passengers. We are trying to spread the word about all the neat things to do here. I have been struggling all evening to upload some pictures to the blog. I guess I'll have to wait until tomorrow to try again. We have very high winds outside right now, so I'm guessing that is having an effect on my internet reception. 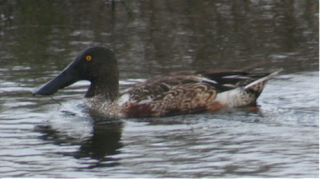 This is a male Northern Shoveler, a duck aptly named for its large shovel-like beak. It's getting late, so I think I'll turn in for the night. I hope I have better luck tomorrow. ...and I started out the day leading a guided bird tour with the van full of customers. We were confined to driving the regular auto tour route because of all of the recent rain, but we had a good four hour tour. Geri, the volunteer who normally does the refuge tram tour, was my driver and was able to enhance the tour with much of the information she provides on the tram tour. The weather was very nice and we wore shorts and tee shirts all day. For some reason, even the mosquitoes were absent for a change. That was an excellent start to the day, and it only got better. As you know, I have been debating about replacing my big, heavy analog tv with a new digital flat screen. Several of the guys around here inspected my present setup and had various ideas of how the transition could be accomplished. Jay and Andy persuaded me that it could be done without too much trouble, so we and their wives headed off to Wal-Mart this afternoon to purchase a 26" Vizio HD flat screen. Of course, when we got there, there were none left to purchase. Jay found an "associate" and asked if there were any more "in the back." I was not too hopeful, but was shocked when he came back wheeling one in for me. When we got back, Andy and Jay proceeded to get the old tv out and were able to use the same brace for the old tv on the new tv to secure it in the cabinet above the front window. We attached all of the many wires for the DISH satellite DVR and my DVD/video tape machine; turned everything on and it all worked! Yes, Emma, there really is a Santa (in this case, two). Just before I set out on the road in 2006, I changed my residence to Sioux Falls, South Dakota, and signed up with Alternative Resources for my mail delivery. They collect and send me my mail twice a month, and today was mail day for me. I was pretty surprised to receive two boxes. I'm afraid I couldn't wait for Thursday and opened them both this afternoon. The box from SD contained my normal mail and a few bonuses. A surprise gift of a sweatshirt from my sister, Pam, and some hand cream and lip balm from my friend Susan in Minnesota. The moisturizing cream and lip balm reminded me of the cold, dry conditions at this time of the year up North. She also remembered Emma, and included several rawhide chew strips for her. Emma dispatched one of them in under fifteen minutes. Emma will be your friend for life, Susan. The second package contained pictures of my two grandsons which I posted on my cabinet door. They grow up so fast......can't wait to see them this summer. Also included was a bag of my favorite candy...sponge candy. Of course now it is called chocolate covered beehives, but it's really sponge candy. It is delicious! I was really surprised that you remembered this, Andy. I had planned to drive to Mission, TX, today to stop at Camper's World to get some glide tape to fix my drapes and to pick their brains about installing a new LCD TV in my motorhome. The rain and cold temperatures changed my mind about going. I'll try again tomorrow. Instead, I just drove to Port Isabel to stock up on supplies that I'll need for Christmas Dinner. I'm providing the appetizers. Because of the rain today, the waterfowl count tomorrow will be impossible. I'm going to bundle up on the couch tonight and just watch TV. I hope it warms up some in the morning. Gumbo......sounds like something good to eat, doesn't it? Well, the gumbo I encountered today had nothing to do with culinary treats. I was up well before sunrise to get ready for the waterfowl count. My usual partner, John, left yesterday with his wife, Diana, and headed out for a visit with relatives for the holidays in Houston. So, I was on my own today. It's about a six mile drive to the start of the route I was censusing and it was pretty foggy driving this morning. I unlocked the gate and started down the unpaved road into the refuge. I made it about a mile before the gumbo caused by yesterday's rain began to build up on the pick-up's tires. Now I'm no cowboy when driving these kind of conditions and I didn't want to get stuck again this year. So, I opted to abort this mission. Of course, with the condition of the road and surrounding area, it was impossible to turn around. That meant backing up the whole way I had driven in. I later ran into (not literally) the two interns that were doing a different route and they had encountered the same conditions and also headed back to headquarters. That made me feel a little bit better about chickening out. Around noon, I joined four of the other volunteers for a ladies lunch out. A restaurant in Brownsville had been suggested to us as having an excellent shrimp buffet on Fridays, so we went to check it out. Now this area is known for the wonderful wild gulf shrimp and we anticipated a real treat. However, we all agreed that we would not return there again. It was rather pricey for a lunch and the shrimp was mediocre. Next we will try a place in Port Isabel. Emma and I are pretty early risers and this morning was no exception. As I got ready to take her for her first outing of the day, I heard the familiar sound of popcorn popping. That's what rain sounds like on the roof of my motorhome. I slipped into my rain jacket and we made a pretty quick curcuit of her favorite watering places. On the way back, the light rain shower turned into a downpour just as we hopped back inside. Of course, this is not what the weatherman forecasted and if I had been able to sleep another hour, I would have missed the whole event. I'm just lucky that way. 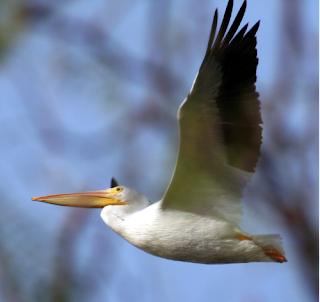 I haven't posted a bird picture in several days, so this pelican is for you fellow bird nerds out there. Later in the morning we had the second shower of the day, but this one didn't involve any moisture from the skies. All of the staff and volunteers participated in a baby shower for Iriz and Rey. Iriz is a law enforcement officer on the refuge and Rey is on the fire crew. We all had a good time and followed the shower with a delicious "winter" potluck. You can't call it a Christmas potluck anymore, don't you know. As you can probably guess, it took quite a few tries before we got a suitable shot. Tomorrow is another waterfowl count day if the roads are passable. Any amount of rain makes the back roads a slippery mess and there aren't any four wheel drive vehicles available for the counters. It was near eighty today with a stiff breeze blowing, so maybe that will be enough to dry them out. I hope so. The high temp today was only forty. I know if you are up north that this would be balmy, but I guess my blood has thinned because I have been very cold all day. It's a good thing I bought a new computer word game yesterday because I only ventured out to walk Emma and to go to Port Isabel to get some supplies for Thursday's potluck holiday luncheon. The game is called Flip Words 2, and the label said it is addictive. It reminds me of a variation of Wheel of Fortune in that you have to find words whose first letter will help solve a phrase. This will add to my stash of games to play during down times. It will join scrabble, spider solitaire, and MahJong (?). This is my third winter in Texas and until today I had not eaten at a What-A-Burger. This is a southern hamburger chain that, unlike McDonald's and Burger King, doesn't fix your burger until you order it. It is hot and not soggy and the fries rival McD's. My friend, Diana, and I headed out this morning for Nueve Progresso, Mexico, to purchase some items we needed for upcoming events. I needed to purchase several bottles of vanilla for my sister, Pam. I will be meeting her and her husband for a week of camping in Austin, TX, at the end of January and she had requested some real vanilla from Mexico. Diana was purchasing some items for a Christmas basket with a Mexican theme. There is an obvious difference from last year when visiting Progresso...armed Mexican army guards at the border crossing, including machine guns. Other than that, the town seems the same. It doesn't smell too good and I really feel the children should be in school and not begging at the crossing bridge. Another interesting point is that it costs a quarter for a pedestrian to enter Mexico, but thirty cents to return to the US. After we finished our shopping, we returned to the car and headed home. That's when we stopped at What-A-Burger so I could really consider myself a winter Texan. We did make another stop along the way and that was to compare some prices on new TVs. I am leaning toward getting a new flat screen TV that is digital before that deadline in February and while I have some support here to help me install it. I also stopped to fill up the car and was thrilled to only pay $13. It wasn't that long ago that I was paying well over $30 for the same amount of gas. The price was $1.49/gal. By the time we got home around four, the temps had plummeted from the eighties and the wind was blowing wildly from the north. The forecast for tomorrow is for only highs around fifty and lows tonight in the upper thirties. I'm turning my little electric heaters on tonight! We didn't have anyone sign up for this morning's bird tour, and because yesterday's trip was such a good one, we decided to offer a bird/photo tour to our volunteers. Four of us hit the road at 7:30 with great expectations. Sorry to say sometimes birds of a feather don't flock together. While we still saw many birds, it just wasn't up to what yesterday was. That was a little disappointing since I had planned to get some good photos because I didn't have to count birds. Yesterday we also saw feral hogs, javalina, and deer, but saw no mammals today. Another firearms hunt began today at noon, so it will be next Friday before we can get on the back roads again. The trip didn't keep us down for long, though. Shortly after noon, we all car-pooled and headed for South Padre Island. We had all been invited to a luncheon at the home of Paul, who is the current person running the "Friends of Laguna Atascosa" bookstore located in the refuge's visitor's center. 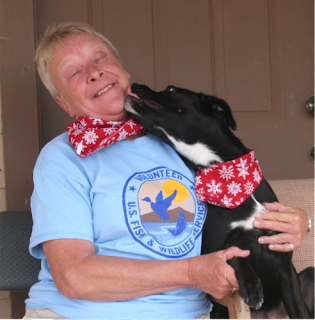 What a nice way to thank all of the volunteers that help out at the visitor's center and refuge. It was an enjoyable afternoon. 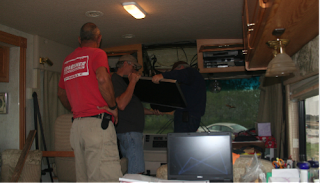 For me, the best part of that gathering was that three of the other volunteers have offered to help me install a TV that is digital friendly if I decide to buy a new one. That is not going to be an easy task in my estimation. My TV is located at the front of the rig above the driver's seat. A new flat screen would be alot lighter than my present unit and I know I couldn't do the conversion myself. Many of the volunteers here are Escapees and are demonstrating one of the clubs missions...helping others. I'm pretty sure I'm going to take advantage of this offer of help. I have a little under six weeks left here before I move on, so I had better get busy figuring out my new options. For those of you folks located up north, I thought I'd let you know that the forecast is to have temps in the mid eighties for the next week. Seems to me like you should come down for a visit! Once a week I work for the refuge biologist and do a waterfowl count. The refuge is divided into eight units and today I needed to count the waterfowl and cranes in units 2 & 3. John, a friend and fellow volunteer, came along to help drive and record the count. He is also responsible for today's pictures. What a morning we had! The sun was shining and the winds were calm. We drive a specified route and identify and count all waterfowl that we see. Thanks to a very wet summer and hurricane Dolly, there is a lot of water on the refuge and the numbers of birds on our route was mind boggling. I use a spotting scope to help identify what I see. I think the route may be about ten miles long, but it took us close to six hours to accomplish our mission. While I counted, John was busy taking pictures. We don't count pelicans, but they seemed to be everywhere this morning. To give you an idea of the numbers involved, we counted 25,005 ducks, geese, cranes, and coots today. There were also hundreds of herons and egrets and what seemed to be about one thousand pelicans. It was a birder's paradise to say the least. 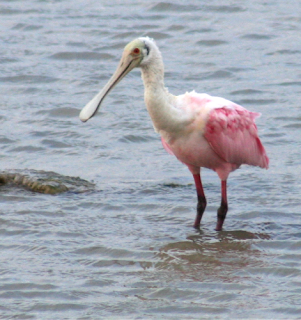 One of the more colorful birds found on the refuge is the roseate spoonbill, which is aptly named for the shape of it's bill. After we finished, I stopped for lunch and to make the creamed cucumbers I was bringing to the potluck this evening. Later, Diana and I continued our work on the powerpoint presentation by taking pictures of the displays in the visitor's center. Last night got into the thirties down here so I brought my tomato plant inside and put it into the shower stall. I can't think of too many things that I like better than a fresh homegrown tomato. I hope to pamper this tomato plant along so I will have a few fresh tomatoes. Having a garden is one of the few things I miss about going full time in an RV. I've worked the last two days, but not too hard. Diana and I have been working on a power point presentation to take to some of the 500 RV parks in the area expounding the virtues of visiting the refuge. I must admit that Diana is doing most of the work with occasional inputs from me. She is a real wiz on the computer. We also headed out this afternoon to visit Baker's Acres to stock up on oranges, lemons, and grapefruits. We established a relationship with them last year so that they keep their drops and rejects on the side for us to pick up to use to feed the birds outside the visitor's center. We are having a potluck dinner tomorrow at the Outpost. One of the volunteer couples is taking the ham bone left from Thanksgiving and making ham and bean soup while the rest of us will provide side dishes. I'm making creamed cucumbers & onions, so had to stop while we were out getting oranges this afternoon to get some ingredients. I also had to refill the small propane tank that I have for my BBQ grill and cash my first ever rebate check from a credit card. One of the other things I did today was return several DVDs that I had rented. I'm not big on going to movie theaters and don't rent many movies, but I did want to see "The Bucket List". I enjoyed it. I've had a list of things I wanted to do before I died, so I appreciated this movie. Going up in a hot air ballon was one of those things I've wanted to do, so I checked that off in October. 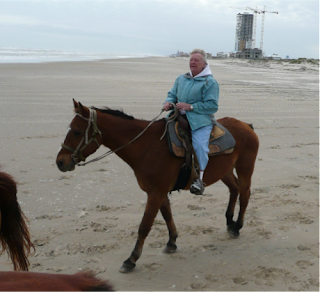 I'm going to try to check off two more things while I'm down here...horseback riding on an ocean beach and flying a kite on a gulf beach. What's on your list? This morning, fellow volunteers Diana and Janie and I went on a five mile bike ride on the back roads of the refuge. Five miles doesn't sound like much, but the wind was blowing about 35 mph and was only at our backs for a short time. If I keep this up I should have "thighs of steel" before too long. I spent the afternoon trying to fix the drapes that cover the front windows of the motorhome. After three years, quite a few of the plastic hooks have become detached and it poses a problem closing the drapes along the runner. I washed them up and tried using super glue to put the hooks back on. Mostly it worked, but there are three hooks I'll have to redo. For the first time in my life, I bought a mango the other day. I wasn't sure what to do with it so I got on the internet and looked up recipes. So, tonight I'll be trying a mango and shrimp salad. Besides citrus, this area also has fantastic fresh gulf shrimp. It should be very tasty. It's back to work tomorrow. There's no one signed up for the bird tour, so I'm not sure what I'll be doing other than attending a volunteer meeting in the morning. We had record temperatures in the high eighties today, but the weather is supposed to really take a turn for the worse over night. I think I'll even have to put on jeans instead of shorts tomorrow! It's a rough life, but I'll muddle through. A White Ibis on a calm day. Don't call me a pig! I had been trying to do my laundry as I usually do on Sunday mornings, but was unable to get to the washer and dryer. Another volunteer couple had the same idea and monopolized the laundry room for over six hours. I can't imagine that they have anything left in their motorhome that hasn't been washed today! Oh well, so I pressed on to Port Isabel for groceries and stopped at the video store and rented "Bucket List" to watch tonight. I hope it's good. It has been a long time since I rented a movie. I was thrilled to get this picture of a bobcat! There are two different cats on the refuge. One is the endangered ocelot and the other is the bobcat. It is next to impossible to see an ocelot. Seeing and getting a picture of a bobcat made my day. What a hoot! We had two folks for the bird tour this morning; a couple from Green Bay, Wisconsin. It's been very windy and chilly for the last two days, but today conditions started to get better. We spent four hours birding the Bay side drive and only had the heat on in the van for half of it. We probably saw about 50,000 ducks today, mostly pintails, coots, and redheads. I always enjoy hearing the sandhill cranes and I was not disappointed today. One of the highlights of the trip was seeing five ten point bucks along the trail. We got some really nice views of them since they were more interested in the does in the area than in us. The early starting hour of the tour means we are the first vehicle around the wildlife drive and get to see more than people arriving later. I spent the afternoon recuperating from a slight stomach ailment that arrived last night. Just before Thanksgiving, the president pardoned at least one turkey from becoming a feast bird. On the Laguna Atascosa Refuge, we have a wild turkey that feels she has been pardoned and takes full advantage of her safety here. This is "Lulu" and she can be seen daily at the visitor's center admiring herself in the reflection of the glass doors or trotting (doing the turkey trot???) around the RV pads. She is especially interesting to Emma. Anyway, I had some difficulties with my internet signal last night so this is being posted on Sunday, even though it was written on Saturday. One of the challenges of living on the road is getting a good haircut. I wear my hair short, so you wouldn't think there could be much that could go wrong with a cut. Think again. I usually stop at a local Wal-Mart to get a trim about once a month. When I was on my way to the Balloon Fiesta in Albuquerque in October, I stopped in Aztec, NM, for a cut. In less than ten minutes, the longest hairs on my head were about an inch long. A little severe, but then you generally don't meet anyone you know while traveling. This is the picture I was trying to upload the other day showing how we light up the engines each night. So far it has worked. Yesterday I worked eight hours at the hunter check station. We had about 230 hunters on the refuge yesterday and it is always interesting to talk to them as they come in after a day out in the wilds. I respect the fortitude of these archery men and women. The count is up to about fifty animals taken so far. Last year 75 animals were taken during the archery hunt and we have four days (and a busy weekend) left this year. The animals aren't totally at their mercy though, many of them head over to the unit where hunting is not allowed. I'll be working the check station again this afternoon and evening so I'd better start getting ready. I grew up in the "Windy City" of Chicago. Let me tell you that today rivaled the winds on Michigan Avenue. The hunters were complaining and we had no takers today for our guided bird tour. Even the gulls were hunkered down in flocks in the water. The ospreys dotted the fields surrounding Laguna Madre and just hung onto the ground. I usually lead bird tours every Wednesday and Saturday, so today Diana, a volunteer that drives for the tours, and I spent the day scouting areas to find birds for this month while the hunts are on. Normally we take visitors on the back roads of the refuge for the bird tours, but during the hunt only one unit of the refuge is open to the public (a unit where there are no hunters so you won't get shot). These are a couple of the white Ibis that we saw today. They didn't seem to be bothered by the winds. We didn't find anything too exciting, so the four hour bird tours in December will not be as exciting as tours in other months. As a solo, I put in 32 volunteer hours per week. In exchange, I receive a full hookup RV site in the Volunteer Village. 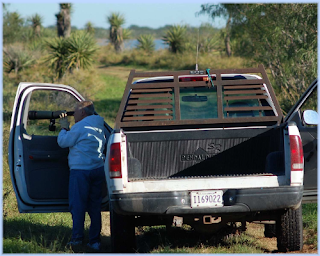 The accomodations at Laguna Atascosa are some of the best sites in the National Wildlife Refuge system for volunteers. We have a volunteer building called the Outpost that has showers, laundry, cable tv, a full kitchen and an area to use for potlucks, games, and other activities. During the month of December, the Outpost is also used as the hunter check station, so our use of the building is somewhat limited during that time. One of the not so nice things about this site is that if you don't lift the hoods of your vehicles and light them up at night, you stand the chance of having wood rats (pack rats) invading your motors and chewing up all your wires and insulation. So, the nine volunteer RV pads are pretty lit up each night. That really helps when it's time for last outs for Emma. I still take a flashlight though, since there are things that go bump in the night like snakes and coyotes, rabbits and toads! Oh My. Well, I'm having a real challenge trying to upload photos tonight so I guess I'll end for now. Today is the first day of the eight day archery hunt on the refuge. Most hunters are here to pursue the white tailed deer, but can harvest as many feral hogs and Nilgai as they can shoot. Nilgai are Asian antelope that were brought to the area 100 years ago. Of course, they escaped and are now found throughout this area. They are big and can weigh up to 700 lbs. Along with the feral hogs, they have a detrimental effect on the refuge, hence there is no limit on the number of these animals taken. Volunteers help man the hunter check station, so I headed over to the Outpost a little after eight to help get things set up. All hunters must check out each day when they leave the refuge and we record their license number and whether or not they were successful. We askeach hunter "Did you get anything?" and they usually answer "Yea, about 50 ticks!" Yuck! Glad I'm not out hunting. At least a dozen animals were taken today. The refuge supplies a cooler to keep the field dressed animals in during the hunt. It's not like Minnesota where you hang the deer from a tree in your yard to cool. Temps today were cool for here, but still in the mid 70's. Notice the bicycles in the back? Hunters must park on the road and bike or hike into the refuge to hunt. They come up with all sorts of trailers to hook onto the bikes to haul out the game back to their trucks.